Get notified when Sugar Bowl tickets are available! 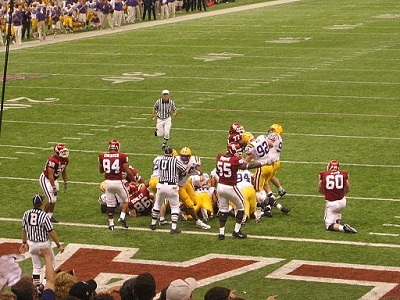 The Sugar Bowl is a championship football game that is held every year in New Orleans, Louisiana. The team brings together top teams from the Southeastern Conference or SEC of the National College Athletics Association, and the winning team walks away with a multi-million dollar cash prize plus bragging rights for the year. Normally, the Sugar Bowl takes place on January 1 with the game being played at the Mercedez-Benz Superdome. The event almost always sells out, but you can try to get your Sugar Bowl tickets to attend the event by using the links above.